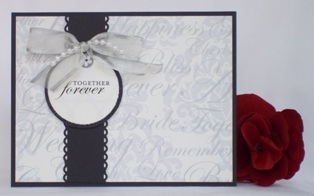 Homemade wedding greeting cards can often be made with black and white prints as with this wedding design. These homemade card ideas can inspire you to make unique wedding cards. 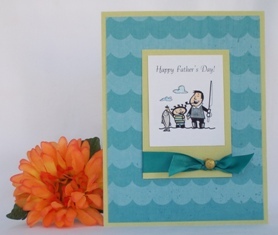 You can be inspired by a sketch when thinking of handmade card ideas. I used an ebook I purchased called 50 Card Making Sketches to help me create this and other handmade wedding cards. I did alter the sketch a little bit but the foundation remains the same. 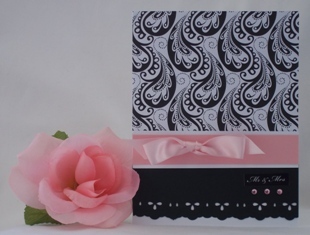 Instead of a square card, I made my card rectangular and for this wedding card idea, I added a pink satin ribbon and adhesive gems. I think the author uses pattern paper that is a little outdated but the sketches are timeless and you just have to use your own paper to make beautiful cards. 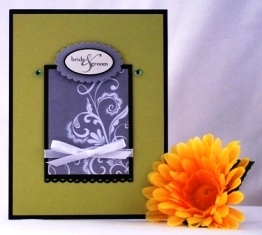 For this handmade card making project, I utilized my craft punches. I used Martha Stewart's Punch Around the Page Cherish Punch. 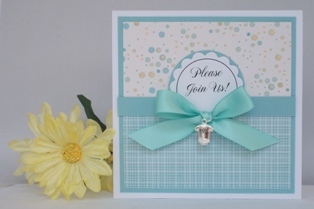 This craft punch is great for making wedding cards because it makes the card more elegant. Again, I used satin ribbon and adhesive gems as my accents. Here is another homemade wedding greeting card I made using a sketch from 50 Card Making Sketches. I used a scrapbook kit which included the wedding paper and the circle sentiment. Coming up with paper card making ideas to make a wedding card is a little easier when you use kits because the stickers coordinate with the paper and the paper is color coordinated. 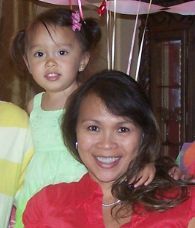 For embellishments, I used a sheer white and silver ribbon and a strand of white pearls. 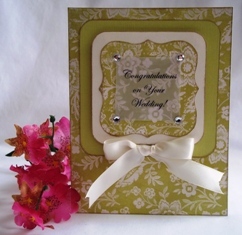 For your homemade wedding cards you can personalize it and type in the couple's name on the sentiment. On your computer, type your message, print it out and then use a circle cutter to cut it out. Ideas for wedding cards can come from a sketch, magazine or a website. Take the elements you like and incorporate it into your homemade greeting card ideas. You can make it simple if you are pressed for time or complicated if you don't like plain cards.